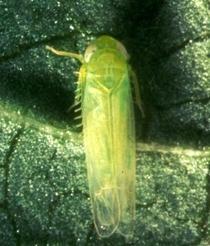 Region: This leafhopper can be found in eastern North America. Life cycle: This insect produces two to four generations each year and overwinters in weeds and garden rubbish. Physical description: The Leafhopper is a small, wedge shaped, insect that is green with white spots on its head, wings and thorax. The adults grow to 1/5 inches long and fly away quickly when disturbed. The nymphs resemble the adults but are smaller and walk sideways. The eggs are yellow to white and are laid in main veins or in petioles on the undersides of leaves. Feeding characteristics: This pest attacks bean, celery, citrus, eggplant, potato, and rhubarb plants and transmit viral diseases. This condition known as hopper burn causes the tips of potato leaves to curl up, turn yellow or brown, and become brittle. Citrus fruit rinds might be punctured or blemished. Controls: Cover plants with a canopy of cheesecloth, muslin, or nylon netting in early summer when plants are a few inches high. Do this for about one month until the plant is established. Diatomaceous earth may also control the hoppers. Blacklight traps will attract this insect. Sequoia is a potato variety resistant to both the leafhopper and potato flea beetle, but not to aphid damage.